That can make the bigger disagreements or issues even harder to deal with and resolve and could cause a rift, not only in your business relationship but your personal relationship as well. When you go into business with family and friends, you also run the risk of different levels of involvement. For example, you may be all in and pulling a lot of the weight, but your partner may be contributing less than they promised but still expecting the same kind of return, putting a strain on, and even breaking down, the relationship that you had. Not all business partnerships with family and friends go bad, though—most people go into a business with good intentions and a solid commitment and things can sometimes work out better than you might’ve hoped. Unfortunately, though, they don’t always, so it’s important to do everything you can to make things work if you’re going into business with family or friends. From choosing business tools together to being transparent about issues and flaws, there are several things you can do to build up trust and help make sure that the relationship stays positive. A difference in expectations will cause a problem in any relationship, so it’s important to sit down and set clear expectations before going into business with a family member or friend. You’ll need to discuss everything from expectations of each person and their performance in their role to expectations for salary, (when the money starts coming in), how much money will be put back into the business, etc. Jeff Kinney said, “You can’t expect everyone to have the same dedication as you.”, so discussing those types of things and the different expectations each of you has beforehand will help you avoid trouble and frustration later on. When you go into business with a friend or family member, you already have a relationship with that person, and they’re already involved in at least one aspect of your life. But now you are adding them to another aspect, and they’ll become an even bigger part of your life than before. While it can be fun to have those worlds combine at times, it can also cause issues, conflict, and upset work-life balance. When you form your partnership and sit down to discuss different matters and issues, it is imperative that you discuss and set clear boundaries too. These boundaries might be that you never discuss your personal lives while on the clock and that you never discuss business outside of the office, or they might be that you never allow your personal relationship to dictate a business decision. Whatever they are, make sure that they are clear, defined, and set. One of the top ten reasons that small businesses fail is poor management and leadership. Sometimes that might mean that the person in charge is incapable of leading how they need to, but it could also mean that the wrong person is in charge of the wrong thing, or that there is someone else trying to dictate how something is run or managed. When you start a business with a family member or friend, it can be too easy to overstep your bounds and enter their space in the name of collaboration. Ultimately, though, this can cause bigger issues. It’s important to discuss and establish a clear hierarchy as well as a clear chain of command and to stick to it so that there are no questions or serious conflicts that arise from that. If you are the CMO and have the final say in marketing decisions, they need to respect that. But if they are the COO and get to determine the best way to run operations, you need to respect that as well. There should be no question or confusion about who does what and who can answer what questions should one arise. When you’re running a business, a lot of things will happen in the day-to-day operations that you or your partner may not know about. Meeting regularly can help you keep an open line of communication and avoid later confrontations when you find out about something you feel you should’ve known about back when it happened. It’s also important to be transparent and open about what’s going on. The Dalai Lama said, “A lack of transparency results in distrust and a deep sense of insecurity.”, illustrating that transparency is key to any relationship and can help your business relationship with your family member or friend improve. Sometimes two people may not be able to agree or find a compromise, especially when they’re so close and feel the other person should be able to understand them. Those kinds of conflicts can tear even the closest friends and family members apart, so bringing on a third party—before things ever get contentious—is a good idea. 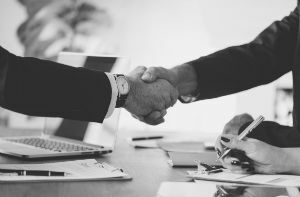 Having a neutral third party involved in the business can help even out disagreements and bring an objective point of view to the table that could save not only your business but your relationship with your loved one as well. More often than not, people advise against going into business with family and friends, yet those relationships, (when all goes well), can sometimes be the strongest and most rewarding. If you’re considering going into business with a loved one, be sure to implement certain practices and discuss certain issues beforehand to help things work out better. Would you go into business with a family member or friend?